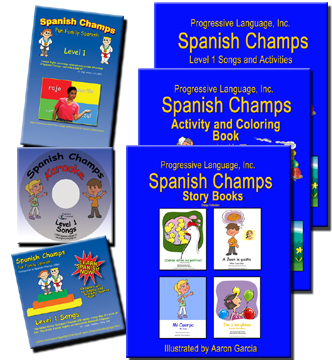 Whether you are teaching one child or large homeschool group, Spanish Champs offers fun and dynamic resources that can help, including: songs, videos, stories, activity books, and detailed lesson plans. Spanish Champs materials can be purchased separately or in learning kits at a discounted price. We offer three kits: Starter, Deluxe and Curriculum, all in two different levels. "The material is very clear and easy to use, the children are very excited about Spanish." The best time to begin learning Spanish is in preschool or kindergarten, and the best way to start is with music. The Spanish Champs Starter Kit includes a song CD with 23 songs; a Video DVD full of skits, stories and games; and an illustrated Song and Activity Book. Why is it best for children to learn through songs? Because songs tap into multiple learning modalities and are the easiest way to get a child producing meaningful words and phrases. One of the most difficult things to acquire when learning a new language is a proper accent. Through singing, children will not only learn meaningful Spanish, but they are beginning to build two very important skills: hearing (distinguishing) sounds in a new language and producing those sounds. Even if children don't understand a word they are singing initially, they are still building fundamental Spanish skills. Comprehension will come over time through various activities. For example, when learning colors, they will learn a song about colors (Rojo Amarillo), then they will watch a short video segment about colors, finally, by looking in the Song and Activity book, it will provide visual reinforcement to tie it all together. Spanish is easy to learn if you use this pattern: sing a song with motions that reinforce the words, see and hear the language being used in fun video segments that engage children, and use the visual representation of each song (as shown in the image above). The Starter Kit contains enough resources to use with your child for a couple of years and is appropriate for children between 2 and 8 years old. They will be learning introductions, greetings, manners, colors, numbers, clothes, food and useful verbs that go with these topics. 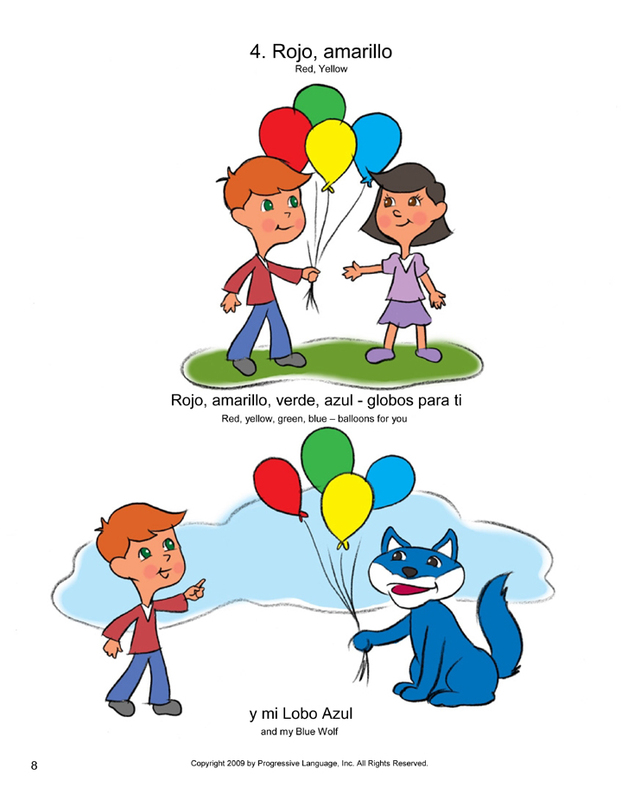 The Song and Activity book not only provides beautiful illustrations for each song, but also all the words in both English and Spanish, as well as a description of how to teach the song and activities that help build comprehension. The Starter Kit provides a 10% discount. Building on the first level, Spanish Champs Level 2 Starter Kit adds 17 more fun songs and introduces many topics, including: animals, daily routine, manners, action verbs, family, more colors, more numbers, descriptions, pronouns, days of the week, and much more. This kit is ideal for children that have been using the Level 1 program and are familiar with many of the songs, or if they have been in a Spanish program for a year and already have comprehension of some basic Spanish concepts. The Level 2 Starter Kit also includes a Song and Activity book, a Song CD and a video DVD. The songs in level 2 reinforce the vocabulary of level one but also are more story oriented. Spanish Champs teaches through fun story-songs that children enjoy. For example, the song Tango de animales tells about a group of animals that get together to dance a tango, but they have a problem, not everyone has a partner and they have to think about what to do. In the song Aladino, a space craft arrives from far away with a "monster", the kids run away before they find out the truth about Aladino and his intentions. Children will have great fun learning Spanish through all the songs, stories, skits, games, and contests in the Spanish Champs Level 2 Starter Kit. The Deluxe Kit adds resources to expand the immersion experience and to provide greater context and reinforcement to accelerate comprehension and speaking abilities. The Deluxe Kit includes the Song CD, DVD and Song and Activity book like the Starter Kit, but adds several delightful resources that enhance the learning experience: a Karaoke CD, a Story Book, and a Coloring and Activity Book. Karaoke? Yes! This is the easiest way to see if children are learning the songs AND kids love to grab a mixing spoon and pretend they are giving a concert. The Karaoke CD plays on a regular CD player, it replaces the words with a musical melody that is easy to sing with. Want to show off for grandma or friends? Pop in the karaoke CD and let your kids sing for them in Spanish! 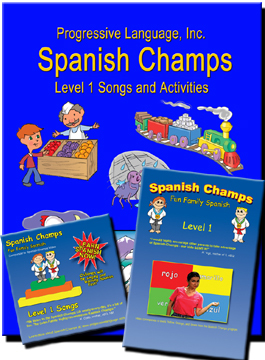 The Spanish Champs Story Books (four stories in one volume) includes delightful stories that use and reinforce the Spanish that is introduced in the Spanish Champs Level 1 Songs. The chicks are missing and the mama hen is looking here and there for them. 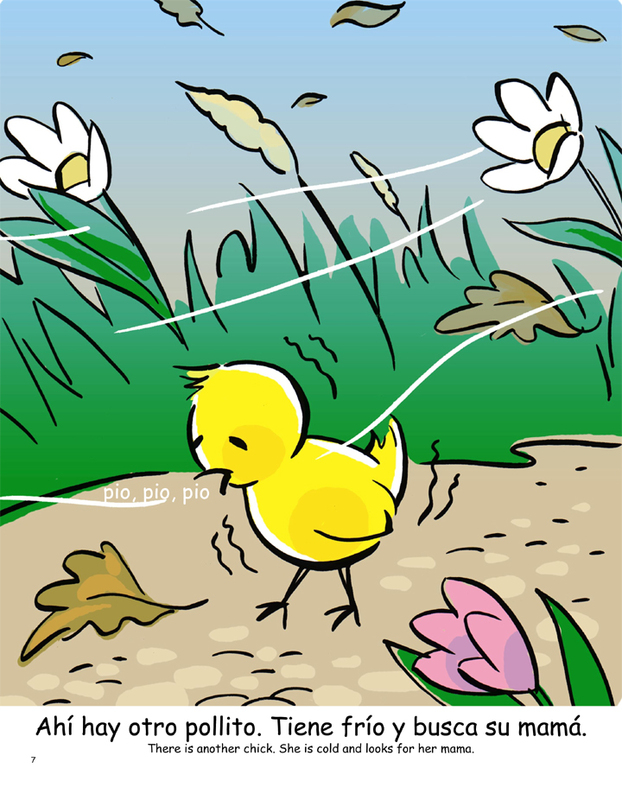 The chicks are lost, cold and hungry. When the mama hen finds them, they settle down for a good night sleep. A fun and simple way to learn body vocabulary. The Coloring and Activity Book contains pull out drawings for each song that children can color and use in a variety of activities. This book also includes 16 activities that are a great reinforcement to the Spanish Champs program. Each activity provides a vocabulary review. Lesson 11 is shown, it teaches body vocabulary and "it hurts". Children draw in each body part, put a bandaid on the body parts and then say "My ____ hurts"
The Deluxe Kit is great for families and home school groups that want fun and engaging Spanish resources to build a solid foundation in Spanish. The Deluxe Kit provides a 15% savings. Need a complete curriculum for structured classes for home school or classroom? Not sure which kit would be best for you? The link below will help you decide based on your learning goals, your setting and how much time you have. It also includes a discussion how to know when you are ready for Spanish Champs Level 2.